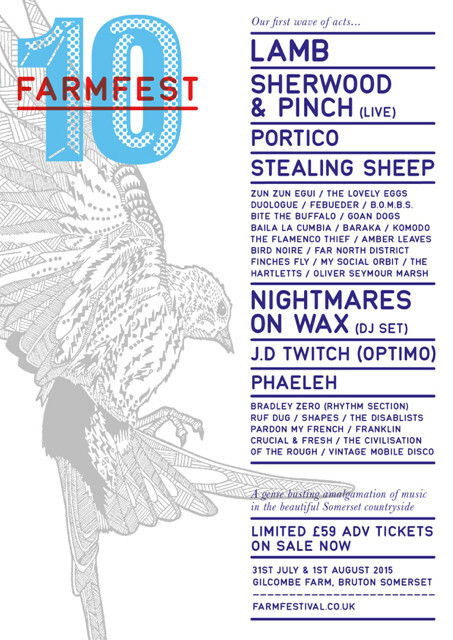 Lamb, Nightmares on Wax and Stealing Sheep are among the first acts to be confirmed for Farmfestival 2015, the festival's 10th year birthday bash from 31 July to 1 August. Joining them on the bill are Zun Zun Egui, the recently reformed Portico and Sherwood & Pinch, who's new album ‘Late Night Endless’ is out this week. 2015 also sees the return of The Lovely Eggs. Nightmares on Wax will headline the DJ offering that includes Optimo's JD Twitch, Bristol's Phaeleh, Bradley Zero (Rhythm Section), Ruf Dug and Bath's very own party starters The Disablists, all of whom will grace the festival's unique combine harvester DJ booth. 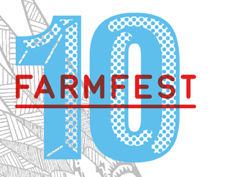 The summer of 2015 will see Farmfest turn the ripe old age of 10 and they will be going big on the celebrations – expect giant party games, overblown site decorations, enormous cake and massive fancy dress. The celebrations will see plenty of special events, new stages and one or two surprises which are being kept firmly under the Farmfest hat. More acts and DJs will be announced over the coming months ahead of the festival at the end of July.